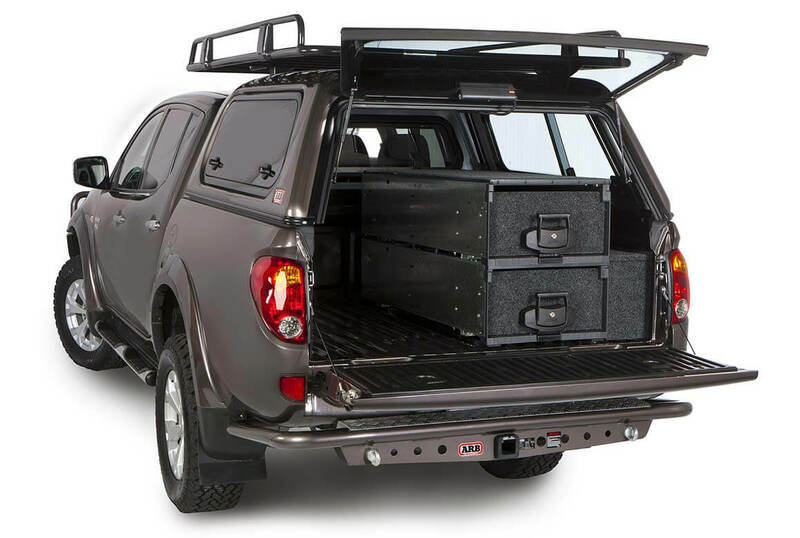 Completely modular, the Outback Solutions range of drawer systems can be individually tailored to your needs and vehicle. Exclusive to ARB and suitable for many vehicles including SUVs, pick-ups, and trailers, this system can be used in non-vehicle applications such as sheds and warehouses. Three types of modules are available, in a range of sizes, resulting in more than 200 possible configurations, all backed by a two-year warranty. For convenient storage of items such as recovery equipment and clothing, the traditional style roll out drawer comes with a fixed top. This allows for additional modules to be stacked on top, or provides a flat surface for storing other, larger items. The Roller Drawer is available in five sizes. The traditional style roll out drawer with a rolling top gives you plenty of storage space and allows a fridge freezer to be easily mounted on top, enabling it to be rolled in and out as required. Available in three sizes and unlike other products on the market, this module utilizes a true flat floor. For convenient access to your car fridge, the low level roller floor sits only 5.5″ above the floor of your vehicle. Available in three sizes, it incorporates a storage tray underneath for smaller items, and like the larger drawers, utilizes a flat floor for easy placement of other items when not carrying a fridge.